With one day until launch of SpaceX’s seventh commercial resupply mission, U.S. Air Force 45th Weather Squadron forecasters are predicting a 90 percent chance of favorable conditions for lift off. SpaceX’s Falcon 9 rocket and Dragon spacecraft are scheduled to launch at 10:21 a.m. EDT, Sunday, June 28, from Space Launch Complex 40 at Cape Canaveral Air Force Station in Florida. Launch coverage on NASA television and the NASA Launch Blog will begin at 9 a.m. The cargo includes the first of two International Docking Adapters, pictured, that will be connected to the space station to provide a place for Commercial Crew spacecraft carrying astronauts to dock to the orbiting laboratory. 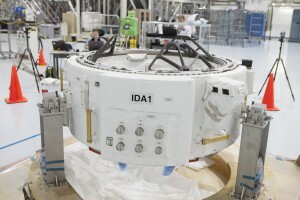 The Dragon spacecraft will be filled with more than 4,000 pounds of pressurized supplies and payloads, including critical materials for the science and research investigations that will occur during Expeditions 44 and 45. Science payloads will offer new insight to combustion in microgravity, perform the first space-based observations of meteors entering Earth’s atmosphere, continue solving potential crew health risks and make new strides toward being able to grow food in space. Research continues to support the twins study and one-year mission investigations with NASA astronaut Scott Kelly. it has been good luck so far.